lou and i have long dreamed of owning a home in palm springs. it’s the sunny desert town where we first talked about getting married and fantasized about what our future might look like. it’s the place we run to when the city gets overwhelming. we have loved it long and hard (that’s what she said!) for it’s mid century modern architecture, endless warm nights, tall palm trees, surrounding mountains and ability to put us into a state of happy calm as soon as we drive around the mountain bend and see the town in the distance. we always talked about retiring there. but i’ve always secretly wondered, why wait until you’re 65 to retire and do the things you know you want to do?? so, it’s with the hugest grin on my face that i type this…. we just bought a house in palm springs (well, technically we’re waiting on the final documents but the deal is as good as done!). and that beaut right up there, that’s our new pool. YES, THAT IS OUR NEW POOL, SOMEBODY PINCH ME!! it’s been almost 7 long weeks of what i consider earning our loan with the bank (more on that another day) but yesterday we drove out there and signed up for home ownership! we’ll leave part of our hearts and a lot of friends in los angeles, which is why as soon as we can we’ll start hunting for a studio apartment in LA and will see if we can swing being bi-city. in the meantime we’ll be packing, moving, and settling into a slower paced life that involves a lot of pool side mojitos. this has been brewing since february but i didn’t want to jinx it (is that weird superstition?!) which is why so many of my posts lately have mysteriously eluded to big things happening. i hate keeping secrets and you can’t imagine how happy i am to finally be able to tell you all! and now hopefully you’ll understand why my posting has been light/sporadic. i promise as soon as we’re settled i’ll get back to regular posting and fill you in on all the decorating details. in the meantime i’ll do my best to keep you at least mildly entertained with whatever other randomness i can mix up! three cheers to a new adventure!! 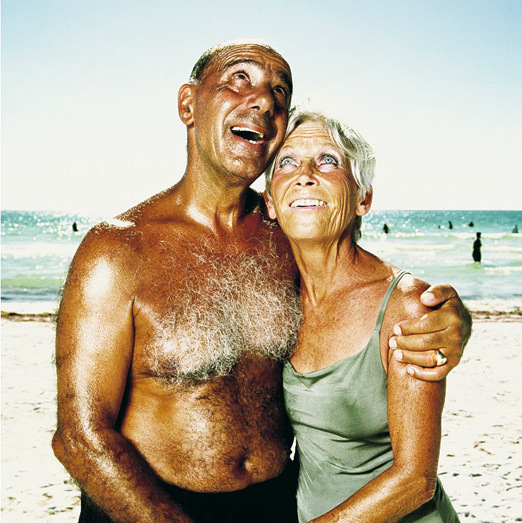 *first photo by ryan robinson from a series he photographed in florida called “snowbirds”. i love them all. Congratulations! And I am so so jealous of your new amazing pool! Looking forward to reading about your experience and seeing your new place! So happy for you! The pool looks amazing, but I can't wait to see how you will work your magic on the inside! Ahhh so exciting – congratulations! I'm coming to visit!!! Congrats!! That looks like a dream!! oh my gosh! that is YOUR POOL? It is so rad. wow, that pool is gorgeous. congratulations on making it happen! congratulations! i just spent a week in palm springs just for vacation… and now my dream is to live there too. the pace/way/style of life is just so relaxing and wonderful. so happy for you making your dream a reality! Congrats! Thats awesome. The year I spent out there was one of the best of my life…. enjoy! Congratulations, this is so exciting!! I will be visiting Palm Springs with a friend in October, maybe you already have some tips for us (where to stay, where to eat, what to do). yahhoooo! So happy for you!! that pool is UNREAL. My in-laws live over there so we'll have to hang–palm springs style one weekend. a HUGE congrats to you and your Mr.!! That is awesome! Loving the pool and to call to send it to Palm Springs!!!! Congrats! WOMAN, you could teach classes in how to LIVE THE DREAM! Let us know if you want company, we wouldn't want you to get lonely out there. Huge congrats & love to you two!! Fantastic! I can hardly wait to see pics of the rest of the house, and how you will decorate! Good for you! i didn't think it was possible but ya'll are making me even more excited!!!!! thank you thank you thank you!! @justina and britt, hell yes! and if you two don't know each other yet we should probably all get together cause i'm sure you'd be smitten with each other! @kerstin, i will know all the best places, send me an email when you start planning! YIP. EE. I would like to try out the splash pool first… to make sure it's safe. That pool likes like a pool of a boutique hotel! I'm so happy for you and Lou and the puppies. Good things always happen to good people, and you guys ARE good people! I can't wait for some interior photos! shoko our new house is your new house! you are always always welcome. and kara, thank you sweet lady! Oh my gosh!!! SO SO excited for you guys. That is kind of like our dream also, so I'm so excited to follow your new adventure. And that pool?? It's like our dream pool. Congrats from Jason + I!! thank you jen! i will work especially hard at getting you and jason to move out, since the seed is already planted! 🙂 next time you're out there make sure to let us know and we'll have you over for a day of lounging and cocktails! SHUT THE FRONT DOOR!!! So freaking awesome!!! Huge congrats on such an exciting purchase. And um, can I come over and hang out in your backyard?? @rachel- i love Cheeky's too! and there's another spot owned by the same people that i'm excited to try. and @victoria, thank you and yes ma'am! open invite! Hi Sarah, I'm a new blogger but, I love your blog. Congratulations on your new place! The pool looks amazing, and the design is beautiful. I'm from Haarlem [= cuter than Amsterdam] and read your blog on a regular base. The sunny pictures you often post make me wish I was friends with you and Lou but this time you got me………. Kidding… or actually not – I have a beautiful old restored house which will be soon online at AirBnB. Whenever you're ready to swop, just let me know! Congratulations, that pool is amazing! Love the Ryan Robinson photo too! thank you tania and sarah! Wow…perfect contemporary retreat in the hills. Love it…congrats. Pool envy right now as it is 104 in the concrete jungle…beachbound! It's such anamazing pool! You deserve it! Congratulations!! congratulations, it will be an amazing adventure and definitely a very happy life! I just came upon your blog while roaming Pinterest. I love it and it really reminds me of my boyfriend and I. "but i've always secretly wondered, why wait until you're 65 to retire and do the things you know you want to do??" = we believe this too. You just never know what the next day may hold so why wait. Congrats on the new place! I can't get over that pool – amazing. Eeeep, that is so exciting! Congrats! My husband and I are actually in the process of buying a weekend house in Palm Springs too (for now we're keeping a small pied-a-terre in LA, but secretly I would love to live in Palm Springs year-round). It's such a dream there. And your house looks amazing! If you don't mind me asking, which part of Palm Springs is it in? Congrats again – this post got me even more excited about our own house-hunting adventures, so thank you!! How does it look 5yrs later and how hot does it get?